Burger King is savage. We know this. In recent years, the chain cranked up its Shade Dial, spitting fire at the president, IHOP, and the Queen of Roasts herself. But today, BK took pettiness to a new extreme in a targeted attack on the centerpiece of American fast food: the Big Mac. On Thursday, the royal burger peddler officially introduced a huge new cheeseburger with some, erm, striking similarities to McDonald’s Big Mac, though with 175% more beef. 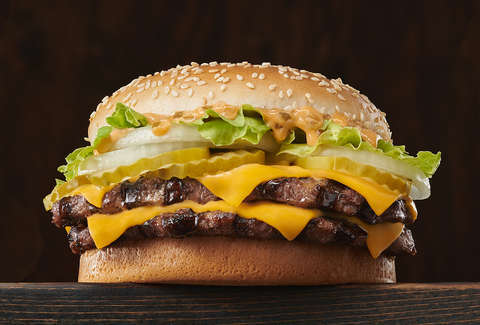 The Big King XL, now on BK menus nationwide, packs more than 1/2 pound of flame-grilled beef, American cheese, sliced onions, pickles, lettuce, and special savory sauce between two toasted sesame buns. Burger King unsuccessfully tried to mimic the Big Mac once before with its (almost identical) Big King sandwich. It had three buns, two patties, and, in 2017, accepted defeat as it was nixed from American menus. Now, over a year later, the chain is trying again with a slightly more original approach (more meat, one fewer bun). And The King isn’t holding any punches with its debut. To celebrate the Big Mac’s 50th birthday last summer, McDonald’s handed out MacCoins -- fancy golden tokens redeemable for one free Big Mac each. Sadly, McDonald’s deemed MacCoins void on December 31, but you know how it goes: When one money-saving door closes, another always opens. On Friday, January 18, select Burger King locations in Chicago (home of McD’s headquarters) will allow you to trade expired MacCoins for a free Big King XL sandwich. Not in Chicago? No worries. From now until January 31, BK fans around the nation can get a free Big King XL with an order of $3 or more on the Grubhub app; and for a limited time only, Grubhub will waive delivery fees on all BK orders. It’s unclear how long the Big King XL will stay on menus, but one thing’s for sure: Burger King is done playing games. Your move, McDonald’s. Kyler Alvord is an editorial assistant at Thrillist. Follow him on Twitter.